Servicing, repairing, and troubleshooting refrigeration systems should be done only by those with the necessary knowledge, training, certification and equipment. It is not a complete service manual. Read your repair manuals, service and parts updates/bulletins, and specific manufacturer's instructions. 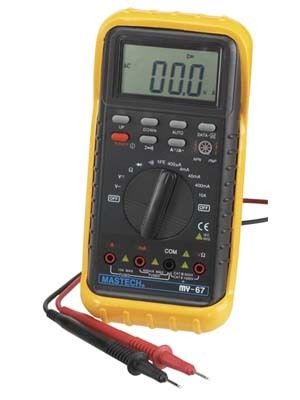 Take all precautions when testing or working on any electrical equipment. If you are not a trained professional technician, you are probably just reading for general knowledge so you can understand your repair person, not to implement what could be dangerous procedures for the untrained. In any case, the reader/viewer assumes all responsibility for his/her actions. Know your limitations! It is recommended that you call a licensed professional refrigerator repair person for actual testing and repairs. "This ain't plumbing, it can hurt you." --Quote from an electrician/instructor. This information is not intended to be a textbook or to replace the training required for professional service technicians. 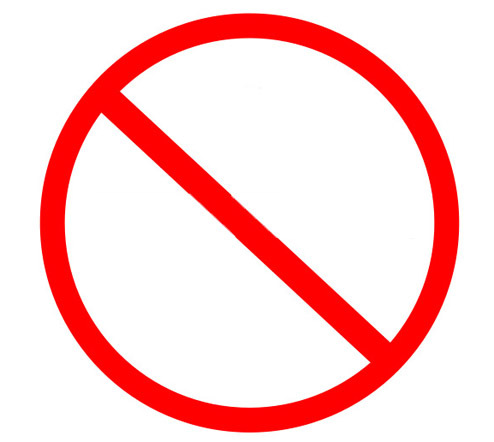 Also, it is not intended to replace other information available from the refrigeration manufacturers. By continuing to read this page, I agree with the above information, and assume all risks and responsibility. If you do not understand the above information or do not agree, please leave this page immediately. or freezer is contained in a sealed unit. As you know, there are many different brands, models and "the age factor" that makes it almost impossible to provide materials to cover every refrigerator. You will find some generic information that may or may not apply to your specific refrigerator. Look for a repair manual for your specific refrigerator if you need more information/guidance and to check if your refrigerator does or doesn't have certain parts/features. For more information about compressors, you can go to the Embraco, Tecumseh, Danfoss or other compressor manufacturer's websites. Consult your repair manuals, service and parts updates/bulletins, and specific manufacturer's directions for the unit you are working on including the expected multimeter readings. Note: A back-mounted condenser has no condenser fan. Sometimes you don't need to test to know something is wrong. (inside the red square) On some models, the housing is held in place with a bale strap or other fastener. Caution: Unplug the refrigerator! These tests are conducted with the unit NOT being plugged in, i.e., NO ELECTRICITY! Unplugged and I can still get shocked? Caution: Before starting any work or testing on a refrigerator or freezer, make sure it is unplugged. 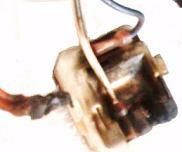 After the technician unplugs the unit, s/he will check to see if the motor/compressor has a capacitor. , even when the power to the unit is off. Before you test or work on a capacitor-type refrigerator/freezer, you must discharge the capacitor, or you could receive a severe shock.  you are qualified to perform these functions. Technicians are trained to be knowledgeable and to practice safety! Before you continue...you must discharge to test! Capacitors store electricity, even when the power to the unit is off (unplugged). Yes, you can get severely shocked! Consult your repair manuals, service and parts updates/bulletins, and specific manufacturer's instructions for directions and safety precautions for the unit you are working on. 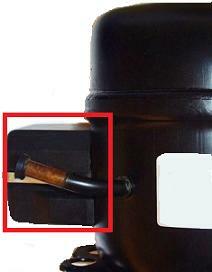 Note: This is a safer way (for you and the appliance parts) to discharge the capacitor. Don't use screwdrivers and other dangerous ways to accomplish this (dead-shorting)! 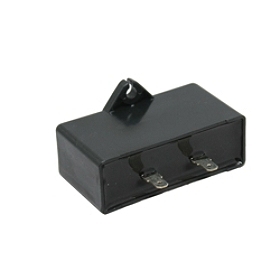 The technician will make sure the capacitor is discharged as mentioned above. S/he doesn't want to get any back fed stored current while touching the bare wires, clips and terminals. By plugging the unit in to check the fan, the capacitor began to recharge (assuming it is working properly), but remember--it can store electricity for a very long time anyhow. Check (for example) to see if your refrigerator has been recalled because of an electrical failure in the relay that starts the compressor can cause overheating, presenting a serious fire hazard. There may be others. The repair technician should check to see if there are updates for this specific refrigerator. S/he should not install outdated replacement parts that have been recalled, replaced, or updated. These kits come with complete installation instructions. 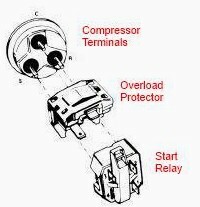 Note: As mentioned previously, there are many different types of overload protectors, start relays, and combinations. 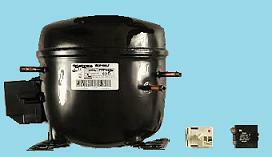 The technician should get the correct replacement part by using the model, series and other information off the refrigerator and compressor tags. If you are replacing one of these, some suggest that you should replace all three. 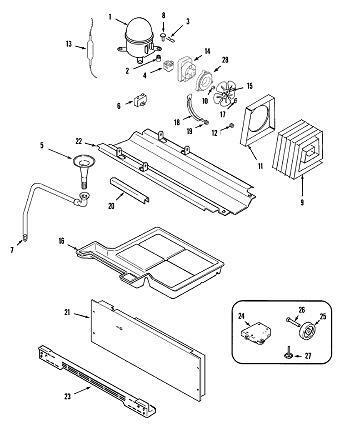 Note: As mentioned above, your particular refrigerator may not have all of these components, they may not look like these parts, or may have combination parts that perform these or other functions at different locations. 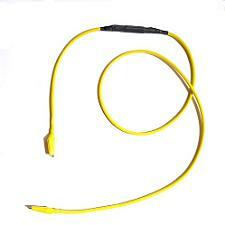 Technicians should refer to the wiring diagram and any references provided by the manufacturer. 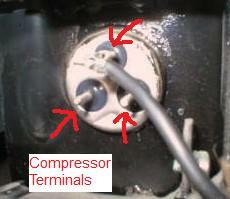 Note the burn marks above the compressor terminals indicated by the yellow arrow. These marks are probably from the overload protector burning out. 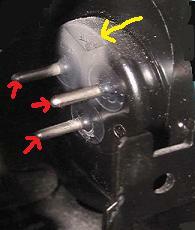 The three red arrows point to the three compressor terminals. If the condenser fan was running normally when the technician plugged it in to check, s/he may want to skip testing the condenser fan. Earlier, the technician made a visual check of the condenser fan when s/he plugged the refrigerator in for a few seconds, then unplugged it. 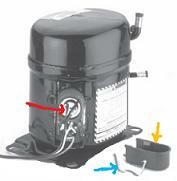 The condenser fan should be running anytime the compressor is running. Hopefully, s/he carefully cleaned the fan, shroud and other areas with a soft brush, cloth and vacuum cleaner. For more information and/or to illustrate, you can right click on some photos/images to enlarge them for a better view. 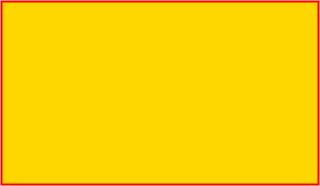 Move your mouse over a word or photo and it will change if it is a link (highlight, change color, a hand may appear). What does the compressor do? Examples of what a technician might do. 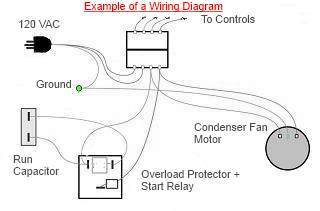 Example of a compressor system wiring diagram. Your refrigerator may be different. What does a new one cost? it is probably a defrost problem. capacitor. This could be fatal." Technicians sometimes make their own 20,000-ohm, 2-watt resistor, soldered, with 12AWG stranded wire and large booted (insulated) alligator clips or get a factory-made one available at an electrical supply store.